The OLD PRISON stands at the top of SHUTE HILL adjacent to SANCTUARY LANE. 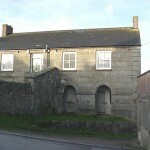 Built in 1837 on land donated by Canon John Rogers of Penrose Estate, the building had eight cells and the upstairs has now been converted into two flats. 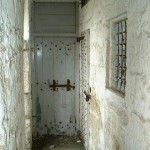 Originally, the only means of detaining people in Helston was in an old `lock-up` located in the nearby Workhouse. During its very early years of operation the Governor of the Workhouse was the Gaoler until the Borough of Helston Constable, JAMES FITZSIMMONS (father of the Helston born World Boxing Champion, BOB FITZSIMMONS) took over the position. However, apparently he did not remain in the position long and was dismissed from both this and his standing as Constable due to `irregularities`! He was however, reinstated as Constable but after a later dismissal decided to emigrate with his family to New Zealand. 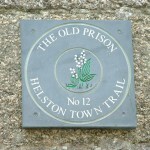 Following an Act of Parliament of 1865 which closed local gaols in favour of holding prisoners at County Prisons, Helston prison was put up for sale in 1866. 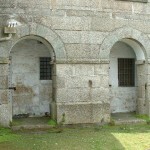 Although the Prison went into disrepair for many years the cells have now been preserved and visitors are able to view them from through the `barred` windows.